Japan and the USA are not the only places to have Sonic events or 'places'. There were SegaWorlds in Australia and England, as well as different promotions and conventions. The areas pictured here can be from anywhere in the world that ISNT Japan or the USA. Each photo will explain where it happened, and have details about the event or area where the photo is taking place. It can be super great to visit a Sonic place, but be sure to check if it's still there before you go...Some of the places may not be as permenent as one would hope. It's definetely important to try to get to them when you hear about them. This is the Castle Gallery of Fine Art in England. It had an exhibit of Sonic art by professional artists & decorated accordingly. The front window has a Green Hill cling-film looking bottom & a Sonic in neon ring right in the middle. 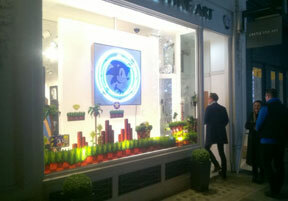 Inside the gallery were many pieces of Sonic themed art contributed by professionals. (Were they also fans? Or was it some kind of challenge to get work seen?) Was the art for sale or just displayed? 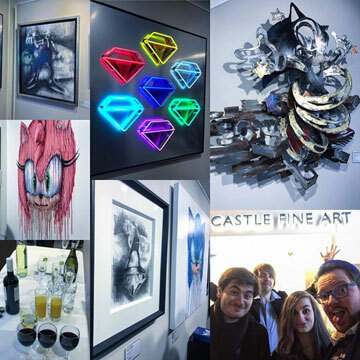 Here are some samples of the art from the Castle Gallery Sonic event. In the top left is a charcoal piece with Eggman, middle is a neon-making artist doing chaos emerald shapes, a metal-worker has created cut metal for Sonic doing a pose with stars & swirls. There's a "very drippy" paint Amy face, and by the same artist a very drippy Sonic face too. The bottom middle is another charcoal Eggman. Is there an online gallery where each of the arts could be seen? This isn't the extent of them. 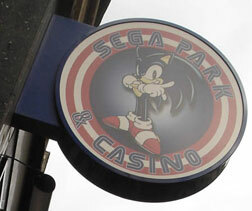 It's the "Sega Park & Casino" sign from England. This photo was taken in 2007, so of course the Sonic on there is modern...but sadly the whole place has closed since then. It wouldn't have been a 'segaworld' because those are kid-friendly and would not have had a casino with actual gambling in there.